due to pressure from a small group of landowners in the Crazy Mountains National Forest who are also outfitters, members of Montana Outfitters & Guides Association, Montana Farm Bureau Federation and the Montana Stockgrowers Association. Those landowners did not like District Ranger Sienkiwicz doing his job, according to Forest Service Policy, managing for multiple use, which includes public access, on our historical prescriptive access trails and roads, to our federally managed public lands. 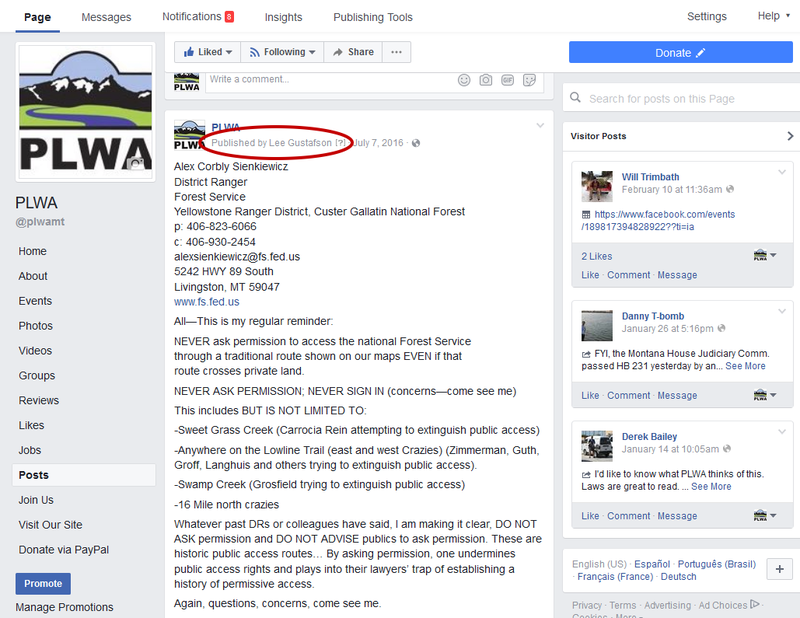 These landowners leveraged their organization positions and connections to Senator Steve Daines, US FS Chief Thomas Tidwell, Region 1 Regional Forester Leanne Marten and newly appointed Secretary of Agriculture Sonny Perdue, writing letters of complaint, including false allegations. No one did due diligence, to investigate the false allegations, before moving the lies up the chain of command. Shortly after Ag Sec. Sonny Perdue was in Montana for an Ag Summit in May 2017, Alex Sienkiewicz was removed from his position as the Yellowstone District Ranger. I requested a FOIA from the Custer Gallatin National Forest for documents relating to the public access situations in the East Side of the Crazy Mountains in the fall of 2016. I recently placed another one for the transfer situation of Alex Sienkiewicz, the former Yellowstone Ranger District, as a result of false allegations from the Montana Farm Bureau, Montana Outfitters and Guides (which land owner Chuck Rein is the Vice President of), a number of local landowners, including the Sweet Grass County Attorney Pat Dringman's wife, Page Carroccia Dringman to Senator Steve Daines and Secretary of Agriculture Sonny Perdue. As I get these and other documents and maps uploaded, I will add them, building the page properly, for now, here are the beginning documents. The screenshot of the PLWA Facebook post involved is below. Have you been in the Crazy Mountains? perhaps you would just like to share your story and/or some pictures of what these particular public lands and access mean to you? I beg you to show the same level of defense for our public access and Alex Sankiewicz's reinstatement as Yellowstone District Ranger, by raising your concerns to the same officials that the privatizers just did with false allegations. Because when you see the roll out of information to come and the players agendas, you will agree, this isn't just about one man and his job, it is about what he was doing as a steward of our public lands that others greedily desire for their own. Even though Sen. Tester was not evident in the letters, please contact him as well.